The Blog of Matthew E Burkhardt, bibliophile and aspiring writer. Unabridged Audible version read by Jonathan Cecil. 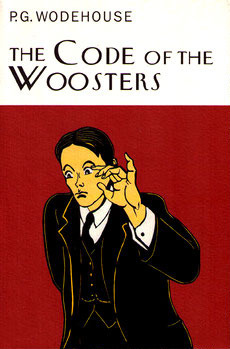 The Code of the Woosters is the first installment in the Totleigh Towers saga. It introduces the characters of Sir Watkyn Bassett, the owner of Totleigh Towers, and Roderick Spode, later known as Lord Sidcup after his ascension to Earldom. The story opens with Bertie recovering from a bachelor party he has thrown the night before for Gussie Fink-Nottle, his fish-faced, newt-fancying friend. While still convalescing, he is summoned before his somewhat beloved Aunt Dahlia and ordered by her to go to a particular antique shop and "sneer at a cow creamer." This is an effort to sap the confidence of the shop's owner and thus drive down the piece's price before it is purchased by Dahlia's collector husband Tom Travers. While in the shop, Bertie has his first run-in with Sir Watkyn (another collector of silver pieces) and Spode (whose aunt Sir Watkyn is planning to marry). Bertie escapes this ordeal relatively unscathed, but later learns that, via underhanded skulduggery involving lobsters and cold cucumbers, Sir Watkyn has obtained possession of the creamer ahead of Uncle Tom and spirited it away to Totleigh Towers. Bertie was already headed there in a frantic attempt to patch over the sudden rupture in the engagement of Gussie and Madeline Bassett, Sir Watkyn's droopy and oversentimental daughter, but now he has been assigned an additional impossible task by Aunt Dahlia: recovery of the cow creamer, which is being guarded both by Spode and the local police. His situation is complicated further by the presence at Totleigh Towers of Stiffy Byng, Sir Watkyn's anarchic young ward, who draws Bertie into her plan to marry the local curate, another old pal of Bertie's named "Stinker" Pinker, and a certain leather-covered notebook of Gussie's, in which he has lovingly and extensively detailed Sir Watkyn and Spode's many character failings, and which has escaped Gussie's possession to roam freely about the local community. The Code of the Woosters is, surprisingly, the first P.G. Wodehouse book I've finished. When I was growing up, my mother often borrowed the television series Jeeves & Wooster, starring Hugh Laurie and Stephen Fry, from the library and we'd watch it together. I had been acquainted with many of the characters in this novel before I'd picked it up. I'd been meaning to dig into some Wodehouse but for some reason only managed to get through one or two of his short stories. This novel is fantastic. Wodehouse's prose is a delight to read and Bertie Wooster, charming yet somewhat dimwitted aristocrat, makes for a fantastic first-person narrator. The story begins with a visit from Bertie's Aunt Dahlia who asks him to go to an antique shop and literally "sneer" at a silver jug of cream shaped like a cow that his uncle Tom wishes to acquire, so as to warm the shop owner up for negotiation when his uncle wishes to haggle for it. What's wonderful about this novel is how much is made of so little. Therein lies the humor of the book. What begins as sneering at a cow creamer quickly escalates as Bertie is presumed to be stealing the creamer by a judge who, in the past, fined Bertie five pounds for stealing a policeman's helmet. The plot thickens as other characters enlist Bertie in various schemes and I found myself wondering how he would avoid serious consequences including, but not limited to, the destruction of Gussie's engagement and an unwanted engagement to Angela Bassett for Bertie, the loss of Aunt Dalia's incomparable cook Anatole, and even the threat of imprisonment. Yet, in the end, with the help of his inimitable manservant, Jeeves, all is, eventually, worked out in the end. I didn't realize that this was the seventh Jeeves novel. I will surely be tracking down the rest and reading those as well. For those that enjoy audiobooks, while Jonathan Cecil could never replace the voices of Hugh Laurie and Stephen Fry in my mind, he does an admirable job narrating this novel and bringing the characters of Wodehouse's universe to life. Matthew has read 6 books toward his goal of 24 books. © 2011 The Write Aspirations. Simple theme. Powered by Blogger.